Our tour group was given about ninety minutes to meander about the paths and boardwalks around the Krka waterfalls. When I got back to where the bus was parked, I still had about ten minutes before the deadline, so I decided to spend those precious minutes checking out a promising-looking section of the water's edge, far enough from the paths that there were no other people around. Several frogs leapt into the water to announce my presence, and I quickly saw three drab-colored garter-snake-sized snakes glide through the water and lose themselves in some partially submerged vegetation. 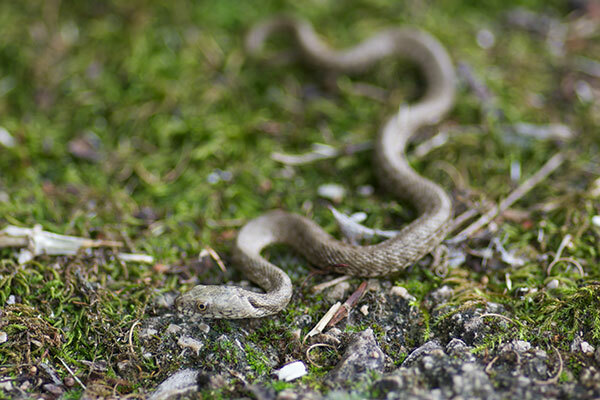 Time was almost up when my eye caught the movement of this tiny baby snake, still on the shore. I gently picked it up and moved it to slightly higher ground so I could get a couple of photos before I had to run back to the bus.